The St. Clair County Parks and Recreation Commission (PARC) is working in conjunction with 13 local units of government to develop a 54-mile paved trail from Lakeport State Park to New Baltimore. St. Clair County helps plan and promote the trail while each local unit of government is responsible for constructing their section of the trail. Most trail construction projects are funded by grants. PARC usually helps to fund the local match required for trail construction grants. St. Clair County’s eastern border is unique. It showcases over 50 miles of shoreline along some of the best fresh water in the world — Lake Huron, the St. Clair River, and Lake St. Clair. Along that shoreline, we have urban areas, open vistas, beaches, parks, attractions, an international bridge and ferries to Canada, giant lake freighters and now a linear trail — the Bridge to Bay Trail, which will be a paved pedestrian/bike path 54 miles in length. 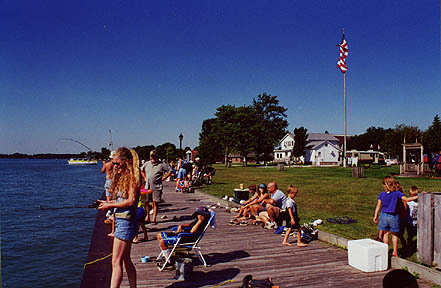 The Bridge to Bay Trail extends from St. Clair County’s northern border; under the Blue Water Bridge; through Port Huron, Marysville, St. Clair, Marine City, and Algonac; past state and municipal parks, museums, gazebos, and lighthouses. Sometimes the trail is within reach of the water’s edge and sometimes a few miles inland. 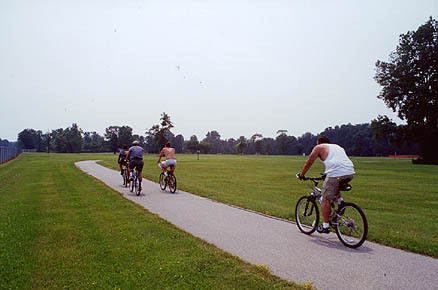 It connects community with community for walkers, joggers, strollers, and bicyclists of all ages. It can potentially link to the Wadhams to Avoca Trail within St. Clair County, the Millennium Legacy Trail, the Discover Michigan Trail, the Macomb County Trail Network, and – via ferry – the St. Clair Parkway Trail in Lambton, Ontario, Canada. Before roads, native inhabitants and early European explorers traveled St. Clair County by water. They canoed, fished, and trapped along the area’s rivers and creeks. Overland routes were paths that generally bordered the waterways. Then came plank trails wide enough for horses and wagons, paved roads for automobiles, and eventually super highways that link St. Clair County with the rest of North America. As St. Clair County has developed toward a mobile automotive society, we sought a balance within nature and a peace that comes from traveling at a slower pace under our own power — by foot or by bike. The result has been a re-emergence both in St. Clair County and throughout the United States to build and utilize trails for pleasure, recreation, physical fitness, and solitude. Members of St. Clair County’s Parks and Recreation Advisory Council (PRAC) and afew government officials suggested constructing a trail for non-motorized travel along the coast from the Blue Water Bridge to Anchor Bay. The idea received initial support from bicyclists, hikers, and equestrians. Taxpayers also approved the idea. In 1994, a majority of voters passed the county’s first millage devoted exclusively to parks and recreation projects. This millage also helped establish the county’s first Parks and Recreation Commission (PARC). In 2000, the original trail concept continues to become reality. Six completed sections and lateral spurs cover more than 20 miles of the proposed 54-mile Bridge to Bay Trail. Running right next to, or a few miles inland from, the county’s much-admired shore, these trail sections connect many pearls — parks and beaches, schools and playgrounds, residential neighborhoods and commercial centers, libraries and government buildings, and tourist attractions. Residents value the Bridge to Bay Trail for its convenience and relaxing recreational value. Tourists and visitors consider it a welcome attraction. The Bridge to Bay Trail is diverse in style, landscape, and purpose. 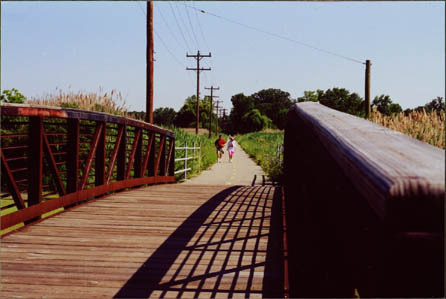 Various sections include boardwalks, river walks, rail trails, safety paths, and bike paths. Parts of the trail share transportation corridors with state highways and county thoroughfares, while other sections pass through quiet wood lots and wetlands. In places, natural vegetation, birds, crickets, and frogs abound. In other places, the sound of children playing is prevalent. Along the shore, sailboats and powerboats grace the beautiful coastal waterway and lake freighters offer mighty and moving majesty. Some sections — in and around the Algonac State Park, the East China Township Park, and Pine Grove Park — are purely recreational. Other sections link neighborhoods with either the country or a nearby community. In total, the beauty of the Bridge to Bay Trail is its functionality — to get away or get to, or simply be. 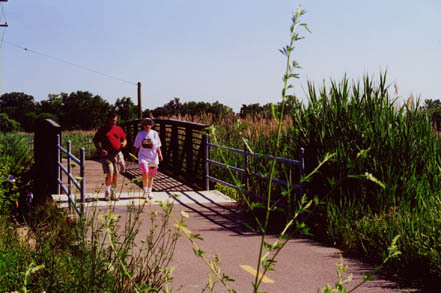 The Bridge to Bay Trail’s recreational popularity is shared by residents and tourists, by walkers (and their pets), bikers, and bladers, by the young, elderly, and families. The Bridge to Bay Trail is a cooperative trail program involving the St. Clair County Parks and Recreation Commission and local units of government in the county’s shoreline communities. Individual communities are responsible for designating trail routes, developing and constructing their trail sections, and maintenance, regulation, and policing. Funding for the Bridge to Bay Trail comes from St. Clair County Parks and Recreation millage, local government funds, and grants. Grant money for the trail has been provided by the United States government through the Transportation Equity Act for the Twenty-first Century (TEA-21), and by the State of Michigan through the Michigan Department of Transportation (MDOT), the Michigan Department of Natural Resources (MDNR), and the Michigan Natural Resources Trust Fund (MNRTF). The Southeast Michigan Greenways Council has provided maps and planning assistance.